Titanic the movie is arguably one of the most influential films of all time, grossing $2.19bn at the box office and propelling the lead actors into super-stardom. So it is my opinion that the gaining the rights to make a slot game based on this movie is a TITANIC coo (excuse the pun) by casino game technology company Bally. For the record, this review will be focusing on the online version of this slot, which is very similar to the land-based version minus some of the visual effects experienced with the cabinet. Before entering the Titanic game you will have to pick which mode you want to play in; 1st, 2nd or 3rd class. As a first class passenger you will be required to wager a minimum of 2.00 a spin, but you will get a chance to play for the Mini and Maxi jackpots. As a 2nd class passenger you will need to stake between 0.80 – 1.60 a spin and will get to play for the Mini jackpot. As a 3rd class passenger you can wager the minimum amount of 0.35 per spin, but will not get a chance to play for any of the jackpots. Your betting level can be adjusted at any time during play. 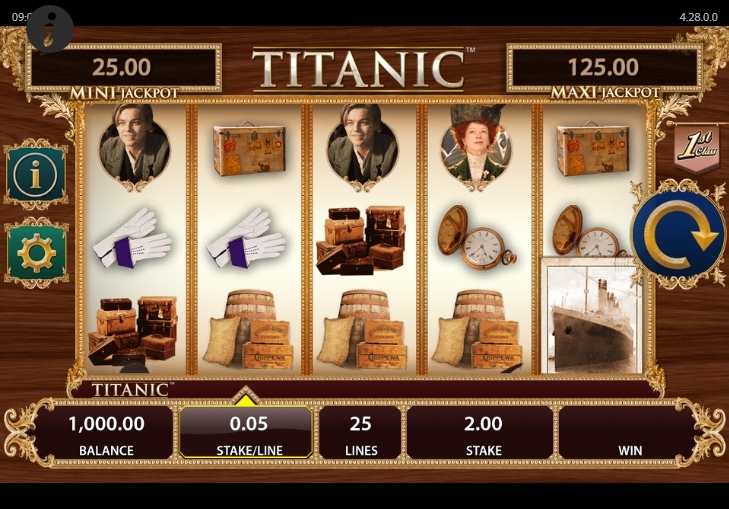 It wouldn’t be a big branded slot if it wasn’t chock full of bonus features – I believe there are 8 in total in Titanic slot. Rest assured you can guarantee low volatility, as Bally target the herd, rather than the serious players. However, experience has told us that this is the norm with this type of slot, examples being Net Ent’s Guns ‘N’ Roses slot and IGT’s Family Guy game. So better to accept this and move on, raahter than getting all cynical. One thing that I am very impressed with in this online slot is that they have all the main characters from the film appearing on the reels, including a very young looking Leonardo Di Caprio and the elegant Kate Winslet. Clips from the romantic disaster movie are also built into the game during features. As previously mentioned, Titantic is full of bonus features, which are triggered in a variety of ways. Due to the vast number of them I will try and explain them briefly below, starting with the random features and then the more rewarding ones after that. Mystery Double Wilds feature – Occurs randomly in the base game, as Jack and Rose dance over the reels leaving a trail of 2x multipliers as they pass. Mystery Wilds Reels feature – Another randomly occurring feature where 2 reels are turned wild. Mystery Jackpot feature – Awarded at random after any base game spin. Pick 1 of 3 tiles to reveal a bonus award or jackpot prize. You need to be playing in either 1st or 2nd class mode to qualify for jackpots. Jack’s Drawing Mystery feature – The last of the randomly awarded features, this one involves picking face down tiles to reveal Jack’s drawings. When you match 3 you will be awarded the relevant prize. The Safe feature – Crack the safe by picking 1- 10 of the safe boxes - each with a hidden cash prize. Then pick 1 – 5 luxury items to determine the multiplier that your cash prize will multiplied by. Pick Up feature – You are presented with prize board and starting from the bottom you work your way up, revealing cash prizes and multipliers on the way. If you make it all the way to the top you will boost your win by 10x. Heart of The Ocean feature – Choose between 6 -30 free spins with a multiplier of between 1x – 5x. You will get a new set of reels which has a special stacked Heart of the Ocean Wild symbol. When this appears it will multiply onto the adjacent reels, creating some impressive winning opportunities. Make It Count feature – Another free games feature which also offers a new set of reels. When the clock symbol appears it will be exchanged for locked wilds, extra spins or cash rewards. OK, so it’s a branded slot and we all know that branded slots are more targeted at casual players that make up the mass market, rather than more serious slots players. That being said, I personally feel Bally have done a really good job with this slot. The fact that they have managed to pack so many parts of the movie into the game is impressive.I also feel some of the bonuses do actually offer some real chances to win something, especially the free spins features. It is certainly a lot more entertaining than Top Gun or Ace Ventura, both of which are from Playtech. 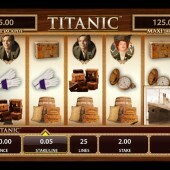 Something tells me Titanic slot it going to appeal to both casual and more serious slots players alike.